Pity the candidate of a rural district in 1904 — it took three (four?) days for candidate Bell to canvas the larger towns in Sonoma County alone, and this district stretches all the way to Oregon (and at the time, it also apparently included more counties in the upper Central Valley). Party leaders and political celebrities were more involved in stumping for local candidates than today; no one thought it odd that vice presidential candidate Fairbanks was speechifying for an hour down in Stockton to reelect a Congressman. Democrat Bell’s champion was Thomas J. Geary, called “Sonoma county’s Democratic boss” by Lemmon’s newspaper. Geary was no inconsequential backwoods Baby Tweed; he earned a prominent place in this county’s hall of shame for pushing through the infamous Geary Act of 1892 when he was a member of the House. This law not only extended the Chinese Exclusion Act for another decade, but also made it more discriminatory. Chinese residents were now denied bail if arrested and prevented from testifying in court. It also forced all Chinese residents to carry a special ID issued by the federal government; caught without papers, unfortunates had to produce “at least one credible white witness” to swear that they were in the United States prior to 1892, else they’d be deported or spend a year at hard labor. Endorsements also had greater weight in that era, particularly since Bell and McKinlay had roughly equivalent credentials, and it seems that neither was particularly well known in the district. Twice the Press Democrat offered editorials praising Bell for his connections to the late Morris Estee, an early California politician who had died the year earlier. Bell’s support from Geary and then posthumously from Estee, however, suggests much about the sort of person he really was. An excerpt from one of the Press Democrat’s two Estee-Bell editorials is below (the other assured readers that Estee knew Bell “personally and intimately”). As Bell became the Napa County DA in 1895, the party described would have taken place some time before he was 22. Following that item is an astonishingly direct editorial attack on Geary from the Republican. And now there is weeping and wailing and gnashing of teeth because the newspaper having the “longest leased line” [an expensive private telegraph connection] declines to admit to its columns the name of Sonoma county’s Democratic boss. Of course the management of the paper is real mean to pursue this policy, but it is not the only mean thing in the world. That paper undertook to give our local Democratic boss prominence a few years ago. It showed him many favors. Through its influence he was pushed forward as the head of the last anti-Chinese movement and the Democratic nomination for the governorship seemed about to be conferred upon him. But he was discovered to be treacherous, even too treacherous to be considered by the Democratic party as a candidate for that or anyother [sic] place, and then he turned against the man and the paper that had tried to build him up after his political fall. Hence the present trouble. Let the good work go on. Rival newspapers are famous for feuds, fights, and even wars — but it’s ugliest when editors attack each other personally in an out-and-out flapdoodle. For weeks, Press Democrat editor Finley and Republican editor Lemmon had been taking potshots at the other party’s candidate for Congress, but the conflict had been mostly polite. It turned nasty and personal after the big Santa Rosa rally for Rep. Theodore Bell on November 3rd, where Bell “cried with vehemence” [PD description] in his speech that it was unfair for governor to campaign for his rival. What appeared next in the papers surely was the talk to the town over the next few days. About the silliest political remark that has been made in this city in recent times was Congressman Bell’s criticism of Governor Pardee for advocating Republican doctrine and the election of Republican candidates for office. He must have presumed on his hearers being liberally endowed with shallow pates, and his local organ gets to the front and advertises that it is the exponent of like cheap demogogy and flapdoodle. A great proposition, isn’t it, that the governor of the state or any other citizen cannot go with good taste to any part of this or any other commonwealth and advocate any doctrine in which he believes, or the elector or defeat of any candidate in office. What a wonderful discovery that this poor puke from Napa has unearthed. And he came over to Santa Rosa and tried this discovery on an audience of his peers and we are assured that they applauded. Funny, isn’t it? What Allen Bosley Lemmon says of Theodore A. Bell can of course do the latter gentleman no harm, for most of those who will be reached by his remarks know both men and can judge of the matter for themselves. But for the edification of others it may be well to here give publicity to certain facts in connection with this campaign that have not heretofore been mentioned. As showing the insincerity of Editor Lemmon’s belated support of Duncan McKinlay through the editorial columns of his paper, they become of more than passing interest. And this is Allen B. Lemmon’s real opinion of the man to whom, as the result of strong political pressure, he has at last been forced to extend a perfunctory support through the editorial columns of his paper during the closing days of the long campaign now about ended. Mr. Bell and his supporters are badly frightened. They are so frightened that they have become thoroughly rattled. If this were not the case Bell would not have made his bad break the other night here in his reference to Governor Pardee participating in the political campaign of the state. If the editor of the Press Democrat had not considered his candidate in the last ditch and about to go down to defeat, it is scarcely conceivable that he would have put into the columns of his paper the scurrilous falsehood uttered Saturday morning — the sentence that eve he, the unspeakable, can make use of only by employing a dash. If he had had his head and were possessed of any decency whatever he would not have sent that sentence into the families that receive his paper on any terms or for any purpose. We scarcely need say that the sentence in question is a falsehood. Either the editor of the Press Democrat must have drawn on his imagination for the scurrilous remark or have received it from some drunken or irresponsible person. Wherever the falsehood came from, we repeat that the editor of the Press Democrat should have been decent enough to prevent its appearance in his columns. Just think of it! A man who has been elected to Congress once and is trying to be elected again standing before an audience in the intelligent and progressive city of Santa Rosa and uttering a statement like the above. Imagine the scene. Bell, with tears in his eyes and sorrow in his heart and in despair declaring, “And they even invade the administrative chambers at Sacramento,” Boo, hoo, hoo, “and drag out Governor Pardee.” Boo, hoo, hoo, hoo, “my governor,” boo, hoo, hoo, hoo, hoo, hoo, “and the governor of all the people, and a flood of tears course down the cheeks of the sad son of Napa, as he wailed, and wailed, and wailed his grief, “to help defeat me.” Boo, hoo, hoo, hoo, hoo, hoo, hoo, hoo, hoo. It was indeed a distressing occasion. The Napa calf simply bawled and bawled in his grief. And this is the fellow the Democrats have named as their candidate for Congress! They should put a bell on him — a calf bell — or it may not be possible to find him after next Tuesday. The mano a mano combat eased up after that skirmish, but both editors were still flushed for battle. 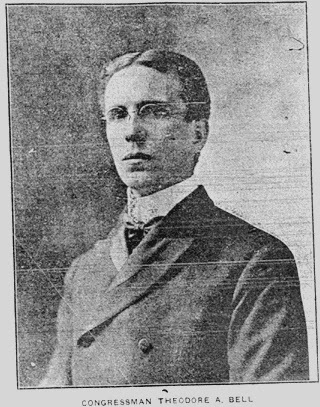 Opposing political parties were labeled a “machine” or “gang,” and Republican editor Lemmon was ready to name names: Besides Geary (described above), others he condemned as part of a Democratic party cabal were Press Democrat editor Finley and Charles O. Dunbar, a state assemblyman running for re-election. Dunbar — who would later become mayor of Santa Rosa — was also a one of Finley’s partners in the Press Democrat, and was the only other person on the masthead (as “business manager”). Finley seemed to have a wee too much invested emotionally in the election’s outcome. His editorials became increasingly shrill, even using long stretches of capitalization for inarticulate emphasis (SEE BELOW). Nearly every edition in the month before the election predicted a cakewalk for Alton Parker and/or Bell; the day before the vote, the PD reported Parker was relaxing on his farmhouse porch reviewing letters from office-seekers. Freudians can also draw their own conclusions as to Finley’s repeated references to Bell being the more manly candidate. The attacks on Republicans became hysteric. If Bell was “a brave, energetic, clean and brainy young man,” McKinlay was an indolent sloth, “lolling about in the luxuriant quarters of the Union League Club” in his tuxedo. Republican victory was a national threat; the over-the-top editorial cartoon showing a “Rooseveltism” bayonet through the U.S. Constitution gave no quarter. Then suddenly it was over, and it was a rout; Roosevelt swept the nation, even breaking the coalition of the “Solid South” for the first time since the Civil War by winning Missouri. Teddy also won the Missouri-settled county here, including every precinct in Santa Rosa by comfortable margins. Probably exhausted by it all, editor Finley headed east for a vacation at the World’s Fair. A couple of weeks later, the Press Democrat reported he’d shipped his dad some persimmons picked from a tree on the Midwest family homestead, a far distance from the flapdoodles. Geary, Dunbar, and Finley are the self constituted committee on good morals in this city. We are not informed as to when they reformed. What do the moral people of this community think of that gang in the character they have assumed? They are the principle ones making Bell’s fight in this county and the ones who will have most influence with him if he should be elected. The Republican “machine,” as most everybody knows, is making the fight of the state in this district in the hope of being able to overcome Congressman Bell’s strength before the people, and defeat him. The men and the influence back of Duncan McKinlay’s campaign are doing their very best to force him upon the people of this district, although they know the people do not want him. IF THESE THINGS ARE TRUE, WHY SHOULD THE “MACHINE” FIND IT NECESSARY TO WORK SO HARD TO DEFEAT THE DEMOCRATIC CANDIDATE? IN A “REPUBLICAN YEAR, AND IN A DISTRICT 3,000 REPUBLICAN TO START IN WITH, WHY IS IT APPARENT TO ALL OBSERVANT PEOPLE THAT THE REPUBLICAN CANDIDATE IS DOOMED TO DEFEAT? A vote for Theodore Bell for Congress today will be a vote to help a brave, energetic, clean and brainy young man along — one who during his ten years of public life has never yet given his friends and supporters any cause to regret having assisted him.